Artech House, 2007. Hardcover. 305 pages. 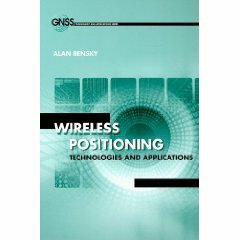 Wireless Positioning, by Alan Bensky, is the 10th book in the Artech House GNSS Technology and Applications Series. In the second sentence of the preface the author states that “range and location are two aspects of position that are related geometrically.” This one statement describes the major strength of this book: the publication deals thoroughly with both wireless distance measurement and positioning geometry. Although this may seem obvious to the GNSS community, many previous books about wireless location using non-GNSS methods have tended to ignore the details of how range, pseudorange, angle, and signal strength measurements are actually made. Instead, they focus on qualitative descriptions of technologies and applications. Conversely, a substantial amount of electrical engineering literature about making wireless measurements often ignores the fact that these systems must be deployed in a three-dimensional world where geometry will affect the position solution. This book does an excellent job of addressing both of these topics with an appropriate level of mathematical detail for an engineer while remaining accessible to a non-expert reader. The book begins with two introductory chapters. Chapter 1 gives a brief introduction and outline and Chapter 2 then introduces the problem of wireless location and describes the various general methods of radio-navigation. Most of the currently used radio-navigation systems (DME, VOR, LORAN, GPS) are then described qualitatively as examples of each method. Chapters 3, 4, and 5 describe in detail the theory behind spread spectrum communication and distance measurement, time transfer, and multi-carrier phase measurement. These three chapters are incredibly useful in that they describe more or less all of the methods that can be used to measure a range using RF signals. Chapter 6 introduces the concept of location using received signal strength as opposed to measured ranges, again with a good balance of measurement theory and implementation detail. In the current era of ubiquitous WiFi, this chapter is particularly important in understanding the many different ways that 802.11 communications networks can and do provide location services for indoor users. With the measurement methods described, the next two chapters of the book deal with the mathematics of position in detail. The title of Chapter 7 is “TOA and TDOA.” However, the chapter in fact describes time of arrival (ranging), pseudoranging, and time difference of arrive in several detailed though unrelated examples. This chapter could be improved with the addition of some discussion of the equivalence of hyperbolic positioning and pseudoranging. The concept of dilution of precision (DOP) is also introduced in this chapter through examples of how positioning geometry affects position accuracy. However, the direct calculation of DOP through the design matrix is not emphasized as it is in most GNSS textbooks. Chapter 8 then discusses angle-of-arrival based position estimation. The final chapters of the book deal with applications and implementation. Chapter 9 discusses cellular network wireless location. It begins with a brief overview of the fundamentals of GSM, CDMA, and UMTS networks, then each possible wireless location method is discussed briefly. This chapter contains enough information to get a general idea of how each method works, but could benefit from more implementation details. For example, assisted GPS (AGPS) is discussed in less than one page, and the various handset and network-based techniques are described in single paragraphs without figures or tables of technical characteristics. Chapter 10 discusses short-range wireless networks and RFID, including WiFi fingerprinting and BlueTooth and Zigbee received signal strength indication (RSSI) measurement. The book concludes with a chapter on the most recent, or at least most recently licensed, wireless location technology: ultra-wideband (UWB). A brief overview of the regulatory environment of UWB signals is given followed by a fairly detailed discussion of impulse radio UWB and orthogonal frequency-division multiplexing ultra-wideband (OFDM-UWB) range measurement. As with each of the preceding chapters, an excellent reference list is given for those who want more information. Overall Wireless Positioning is a very good book. It is written at an appropriate level for its intended audience. The author states that the book is aimed at “working engineers who are assigned to projects involving wireless distance measurement and location.” However, it is also perhaps the first book that would be an appropriate self-contained textbook for a senior undergraduate or graduate engineering course in wireless location.